Part of the blame for the political crisis in Ukraine, which has provided a pretext for the Hitlerian moves on Ukraine by Russia, can be assigned to an American. His name is Paul J. Manafort, and his contribution to the crisis was helping Viktor Yanukovych convince a majority of the Ukrainian electorate that he was someone he was not. In short, Manafort helped the corrupt and autocratic Yanukovych lie his way to electoral success. In the last part of 2004, Yanukovych – with the help of a few rich and powerful friends – tried to steal the Ukrainian presidential election. The brazen effort caused a backlash, with a large contingent of Ukrainian citizens rebelling against this subversion of democracy. The resulting Orange Revolution led to a court decision overturning the election, requiring a new vote. In the election that followed, Yanukovych and his Party of the Regions were decisively defeated. In the 2004 presidential campaign, the real Yanukovych was on display: a man with the mentality of a political boss in an autocratic political system, a friend of Russia, and a man with cynical values common among kleptomaniac political leaders in many other countries formed out of the Soviet Union. Manafort began his work as a political consultant for Yanukovych and the Regions party in 2005. He was brought to Ukraine by one of the oligarchs, a steel and coal tycoon by the name of Rinat Akhmetov, to help him improve his image [Page 2006; Boudreaux 2010]. He was soon thereafter engaged to assist Akhmetov’s favorite politician and his party to recover from their 2004 disaster. Manafort is the type of guy you have seen if you have spent any time around politics and the politically powerful. He is one of the slick guys in fancy suits whispering something obviously significant to someone who looks important. He is one of the heavy-lidded, tight-lipped behind-the-scenes political operators, the political pros, who make a very good living operating in the shady nooks and crannies of democracy. 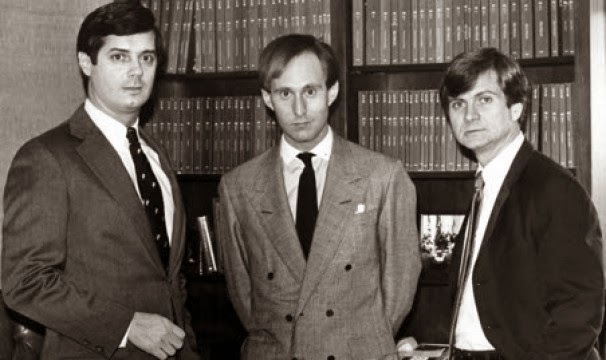 And for many years, Paul Manafort was among the most successful of them, assisting in the presidential campaigns of Ronald Reagan, Bush the first, and Bob Dole. He also worked in the White House for President Ford in the 1970s. What did Manafort do for Yanukovych to earn these large payments? He worked his public relations magic to make the Soviet-style politician a new man – or at least to appear to be a new man. He softened Yanukovych’s image and made his acceptable to a wider range Ukrainian citizens. He created an image for a man and a party that helped them take power in Ukraine. [T]heir influence is unmistakable. 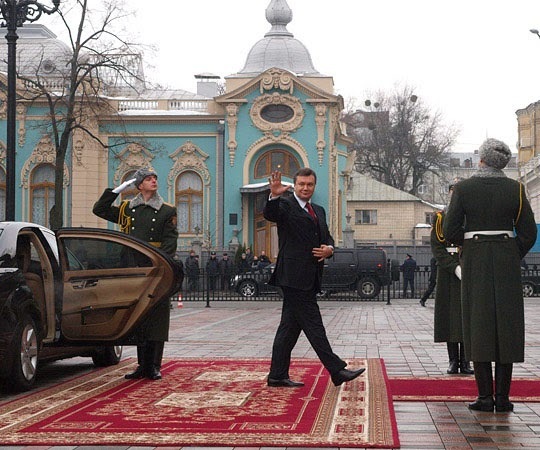 He [Yanukovych] has abandoned the funereal black suits and white shirts he wore for the 2004 campaign in favour of blue or grey suits with co-ordinated shirts and ties. He has given up addressing supporters in prison slang, and now speaks in Ukrainian as well as Russian. His wife, who accused Mr Yushchenko's supporters of being high on ''psychotropic'' oranges, has been conspicuously silent. He still says that he opposes joining NATO, but now backs EU integration. ''Ukraine must become a bridge between Russia and Europe'', is his new catchphrase. But importantly, he has made between 40 and 50 trips around Ukraine since January, meeting tens of thousands of voters. Yanukovich still has the bulk of a retired linebacker, but he has largely shed the coarse mannerisms that he picked up as an ex-convict turned party boss in the political free-for-all after the Soviet Union's demise. On the stump this week, Yanukovich has repeatedly declared that he is the only politician who can bring stability to a nation weary of political turmoil. …the once avowedly pro-Russian prime minister has ditched the bouffant hairstyle favoured by Soviet apparatchiks, taken to playing tennis with the US ambassador, begun speaking in Ukrainian rather than Russian and has even pledged to take his country into the European Union. Under the tutelage of an American political consultant with ties to Senator John McCain [Manafort], Mr Yanukovych has put the Orange Revolution on trial in recent weeks. He has echoed another American politician, by asking Ukrainians whether they feel better off now than they did five years ago. 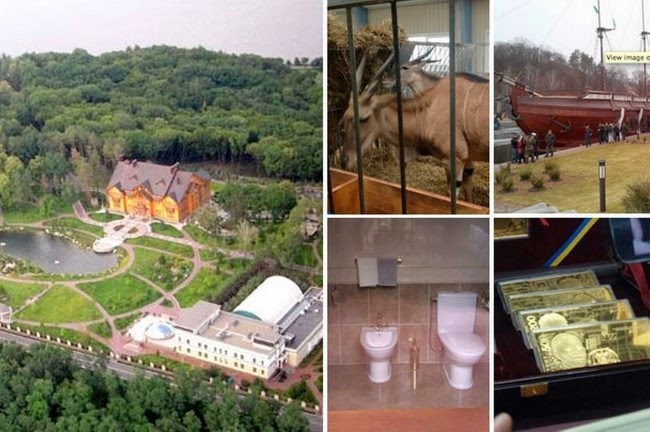 Mr. Manafort’s influence was apparent on Mr. Yanukovych’s visit this week in Dneprodzerzhinsk. His old style tended toward rambling speeches that seemed more suited for Politburo meeting than a campaign rally. But throughout his day, he spoke in short, crisp sentences that rarely strayed from this theme of the Orange Revolution’s failures. Of course, the political campaigns in Ukraine did not take place in a vacuum, and the failures of the Orange Revolution, and the unpopularity of its leaders, contributed to Yanukovych’s successes, as did unwavering support of many Russian-speaking Ukrainian’s living in the Eastern part of the country. Nevertheless, Manafort made it possible for Yanukovych and his party to take advantage of the situation by presenting a new, softer, modern image – dressing the corrupt Soviet autocrat is the fine clothes of an honest democrat. 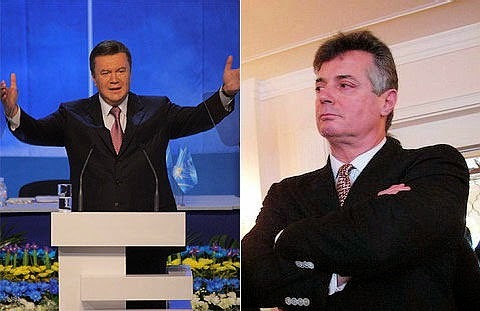 Why Did Manafort Help Yanukovych? An American ad man whom Manafort brought in to help with the 2010 Ukrainian presidential campaign told Burns and Haberman  that Manafort was “obsessively focused on the race.” He is quoted as saying, “There was no hour of the day or night when he was not available to respond to an email.” Another Manafort friend described his drive in this election as “maniacal.” Apparently the work for Yanukovych was more than simply "another job" to him. Manafort … said Thursday that he would not discuss his advice to Yanukovich or how much he is being paid. But Manafort said he believes that the prime minister is an outstanding leader who has been badly misunderstood. ''The West has not been willing to move beyond the Cold War mentality and to see this man and the outreach that he has extended,' said Manafort, 58, who favors monogrammed dress shirts and has the looks of a network anchorman. Hoping to undercut Yanukovich’s more polished campaign, his opponents have charged that oligarchs like Akhmetov are simply buying a better candidate. Manafort said such criticism was unfair, and he emphasized that his vision for Ukraine extended far beyond Sunday. 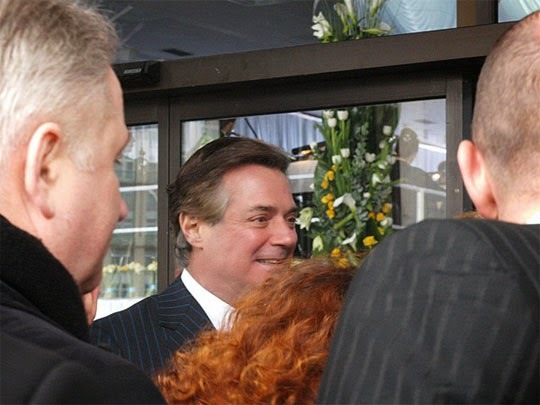 Mr. Manafort declined to discuss in detail his relationship with Mr. Yanukovych, but he acknowledged that he was pursuing a classic anti-incumbent strategy. According to Burns and Haberman , Manafort became an advisor to Yanukovych after he was elected president of Ukraine in 2010. He also became involved in business projects in Eastern Europe. At this time, Manafort’s current work and location are unknown. Burns and Haberman  reported that in early March, not long after Yanukovych abandoned his opulent multi-million dollar mansion to flee Ukraine, Manafort’s former colleagues did not know his whereabouts, and he did not respond to messages sent to half a dozen email accounts linked to him, nor did he answer calls to phone numbers at his Virginia and Florida addresses. However, a couple of March twitter messages -- true or not -- placed Manafort in an expensive hotel in Kiev. In one of his few newspaper interviews after starting his work in Ukraine, Manafort said that in his work there he wanted to “play a constructive role in developing a democracy.” To do so, he helped a corrupt thug take power, thereby steering a nation into a crisis that not only hurts its citizens, but threatens to destabilize the world. Manafort’s actions in Ukraine suggest that where ever he is and whatever he is doing now, he is making lots of money, justifying his work in lofty phrases, and showing no concern for its consequences. “A Political Power Broker.” 1989. New York Times, June 21, p. A19. Blomfield, Adrian. 2007. “Commentary: Ukraine’s prime minister turns to US-style spin.” The Daily Telegraph (London), September 29, p. 18. Edsall, Thomas. 1985. “Partners in Political PR Firm Typify Republican New Breed.” Washington Post, April 7, p. A8. Levy, Clifford. 2007. “American strategists shaping Ukraine race; Political makeover buoys prime minister.” International Herald Tribune, September 27, p. 3. Levy, Clifford. 2007b. “Image repair perks up Ukrainian’s prospects; American aids a once-reviled leader.” International Herald Tribune, Oct 1, p. 1. Levy, Clifford. 2010. “Toppled in Ukraine but nearing a comeback.” New York Times. January 15, p. A4. Meier, Barry. 2008. “In McCain Campaign, a Lobbying Labyrinth.” New York Times, May 25, p. 22. Olearchyk, Roman. 2010. “U.S. political advisers add polish to Ukraine election candidates.” Financial Times (U.S. edition), January 28, p. 5. Page, Jeremy. 2006. “American spin doctors turn Ukraine’s Orange Revolution into Blue.” The Australian, March 29, p. 10. Shenon. Philip. 1989. “Bush consultant peddled influence at H.U.D., he says.” New York Times, June 21, p. A1. Manafort is just a low-life criminal. I could tell this the moment I saw him when he was running the Drumpf (anotherlow-life criminal) campaign.